Latest technology and creative skill – that is the secret of KDH Advertising Technology. Our employees in production have a trained eye for the smallest details and our constructors as well, think one step further. Just like that, amazing results are developed out of apparently usual raw materials again and again. Without a problem we produce mini and big series, systems of any shape and size as well as custom-made products. Whether for advertising technology, illuminated advertising systems, interior advertising or fair constructions – we manufacture suitable for your brand. On the following pages, the quality of our products becomes apparent. The modern laser technology offers innovative solutions for the permanent and contrasty marking of products. Whether metal, plastic, glass, ceramics, film or wood – there is hardly any material, that can’t be marked by laser. With laser technology, materials can be marked permanently and flexibly in a fast and high-quality way and without causing any polluting by-products, by using a material-saving and force-free labelling procedure. As we are a long-standing producer of large advertising systems, we obviously also know the processing of steel, which is one of the most versatile materials at all. The drilling of threads as well as the milling is done by us – always with the most precision. We handle aluminum profiles and molded parts or manufacture heat sinks for electronic components. 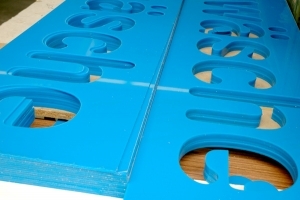 CNC technology allows us the production of unusual products, also in small or single editions. Even the edging for design purposes has been involved as a production step in our production flow for a few years. Metals are the most important materials in our modern world. Early on, people discovered their thermal conductivity and deformability. Those characteristics are used by KDH as well, in order to form smallest elements into impressive stand elements by doing filigree detail work. Program-controlled punch and bend centers, laser cutters, engraving and milling plotters or welding robots make various realizations possible. Supported by innovative light and illumination technology, we make sure that no one gets past your advertisement. Contact or visit us – we’d like to show you our production sites and give you an insight into the various possibilities of metal forming. Whether neon or LED signs – we make your company widely visible. Already in the planning stage, we bear in mind efficiency and environmental sustainability. That is why we recommend the use of LEDs in illuminated advertising systems: they don’t need much space, the luminosity is consistently high, durability is long and there is only a little need for maintenance. The electronic realization of your advertising system is equally important for us as the graphic planning – because nothing is more tragic than a great concept with a bad illumination. In order to get your new advertising technology reliably from the production site to the target location, we are reluctant to trust third parties. That is why we do not only offer our clients a competent consultation, professional planning and precise production, but also a broad range of logistic services. Equipped with our own fleet, we transport the systems we produce to the installation site by ourselves. We coordinate routes and dates and ensure the perfect condition of our technology before our team begins the installation. By that we can make sure to deliver you exactly what we promised to you – advertising technology of highest quality. That kind of commitment and knowledge, our demand of professionalism and quality, combined with the environmentally friendly handling by our whole team and our adherence to delivery dates is what gets us the appreciation and loyalty of our clients. Plastics are characterized by a series of strange qualities, when compared to ceramic or metallic materials. The most formable of all materials is therefore perfectly suitable to be processed within the advertising technology. Vacuum-moulded elements made of synthetic materials find widespread uses in merchandising displays. An outstanding feature of plastics is that their technical characteristics like formability, hardness, elasticity, breaking resistance, temperature and heat resistance can be varied by the choice of raw material, manufacturing process and the admixture of additives. Plastic is the material, our innovations are made of.